A riotous tale of two very different brothers. Alonzo’s big brother, Don Carlos, always wants “más,” more. If Alonzo eats one ice cream cone, Don Carlos eats four. When Alonzo wears one hat, Don Carlos puts on seven. Trouble begins when Don Carlos decides to add snails to the menu of his village restaurant, and snails eat their way through the village. 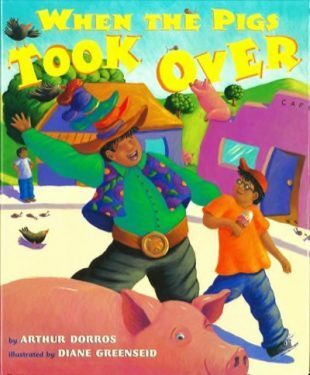 The brothers bring in birds, then pigs, and the village is overrun with the pigs trying to eat everything in sight before Alonzo has an idea that may save the day. Each of us wants more of something on occasion. That’s only natural: if a little of something is good, more might be better. Sometimes that works out fine, but other times it can lead to trouble. In this story, Don Carlos has lots of ideas about more, which lead to more and more…of a mess! It’s a question of balance, in nature too. People brought rabbits, which had never lived there before, to Australia and the rabbits almost took over. Later, foxes were brought in to control the rabbits with more unexpected results, chasing many animals besides rabbits. All around the world, people can have big and unintended impacts when we step in. Once, while camping, I set my backpack down for the night and awoke to hordes of ants that had chewed through bags and the food inside. Then they had scurried into my sleeping bag and were nibbling to get a few samples of me. Please, no more! More is not always better!